Georgia State Demographics: How diverse is it? Learn About Diversity at Georgia State, and how it is Similar to Other Schools in the Country. We combine elements of ethnic, geographic, age and gender diversity to create a total diversity grade for every school. Quite diverse across all factors, Georgia State University is ranked #300 nationwide. Many young people value the ability to meet and learn from different ethnic and racial groups, which is more likely to happen at a diverse school such as this one. Georgia State University is ranked #96 in ethnic diversity nationwide with a student body composition that is far above the national average. 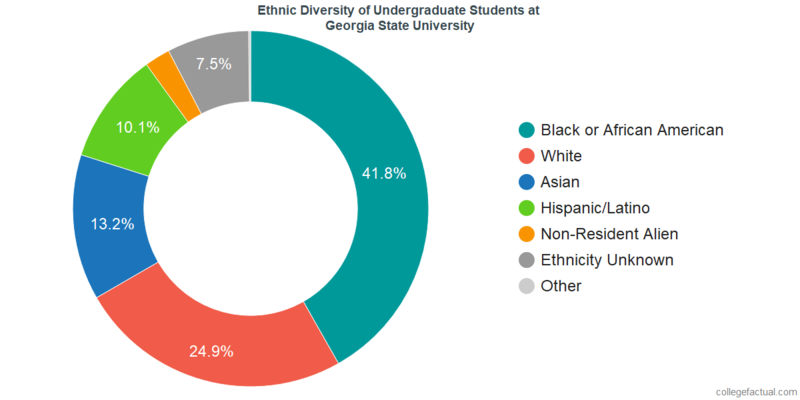 This chart will display the diversity of undergraduate students at Georgia State if it is available. Georgia State boasts excellent ethnic diversity. At Georgia State University, the disparity between men and women on campus is on par with the national average. The undergraduate student body at Georgia State is equally balanced. This university is ranked at #1,108 in male to female diversity nationwide. The undergraduate population is comprised of 10,309 males and 14,919 females. 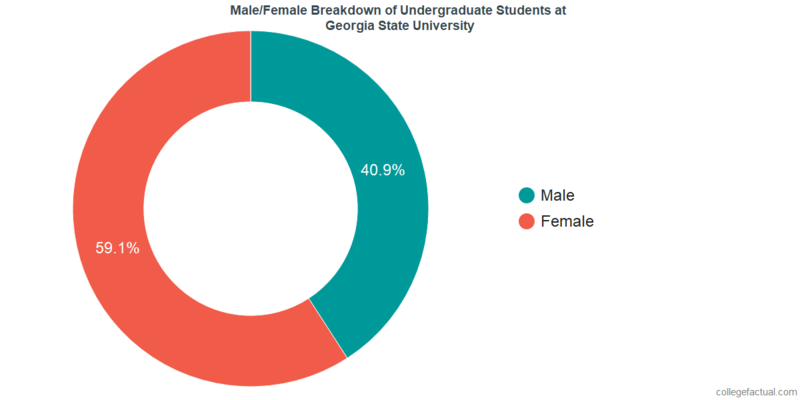 If available, the chart below includes the male to female percentage among Georgia State's undergraduate students. The disparity between the counts of men and women at Georgia State University is on par with the national average. If available, the chart below includes the male to female percentage among Georgia State's faculty. The ratio of male to female faculty at Georgia State is above average. To come up with the geographic diversity for each school, we factored in where every student lived before they were admitted. 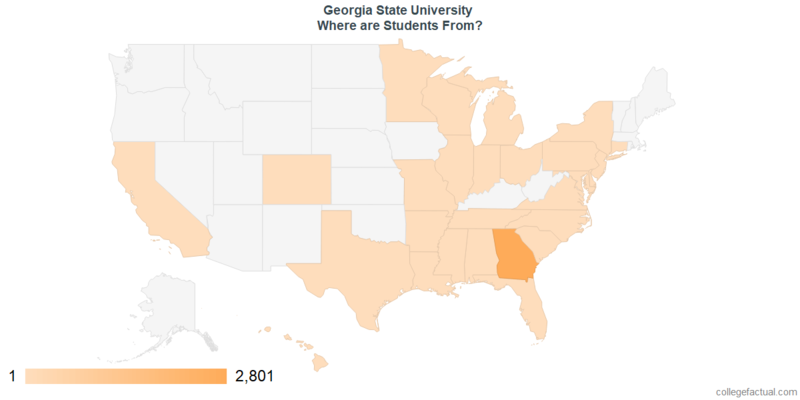 Over 90% of the students attending Georgia State University come from within Georgia. This puts Georgia State's level of geographic diversity about the same as the national average and gives it a national geographic diversity ranking of #821. There is a medium sized community of about 1,824 international students at Georgia State University representing at least 49 countries. Click on the Georgia State International Student Page for more information. Would you prefer a school where the student body represents a blend of different ages and generations, or would you prefer a school where most students are the same age as you? The traditional student is between the ages of 18-21. At Georgia State University, 42.9% of students are in the age 18 to 21 bracket, compared to the national average of 60%. We rank Georgia State #990 in the nation for student age diversity. 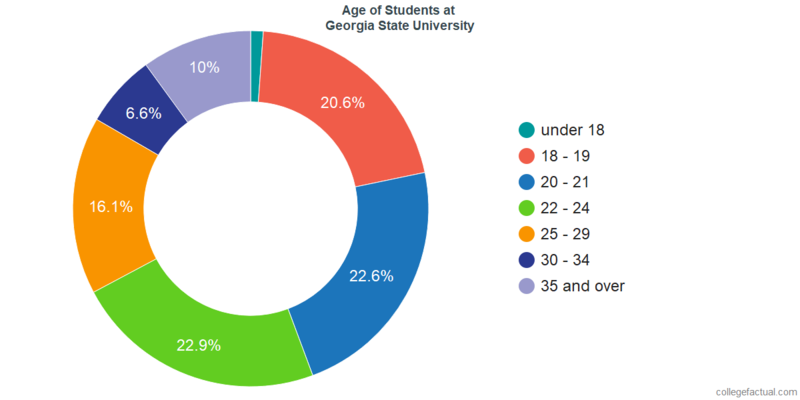 The chart below displays the age range of the student body at Georgia State. Broadly speaking, diversity is the word we use to describe a mixture of people and ideas, and the traditions, belief cultures and systems that come with them. When most students seek diversity on a college campus, what they are actually seeking are opportunities to express themselves and find community with others who believe the same way, as well as opportunities to learn from those from different backgrounds and cultures. How is Georgia State doing at attracting students from all economic backgrounds? Even a school with high racial, ethnic and geographic diversity may not be diverse when it comes to the income levels of their students. To get a better idea of how Georgia State is supporting low-income students check the Financial Aid Page. 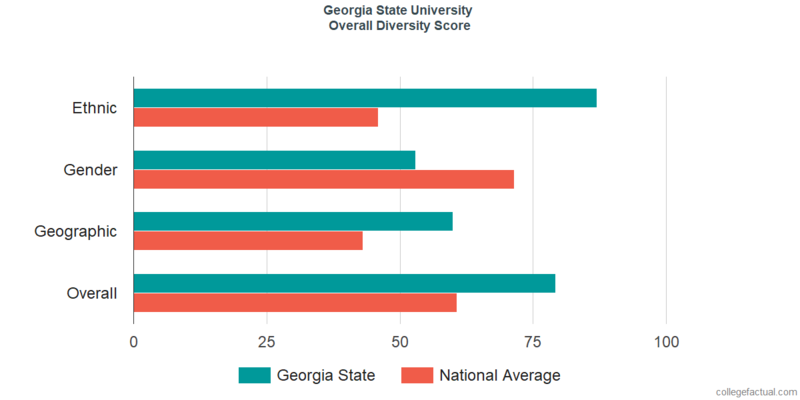 Is Diversity Important to Georgia State? The university years provide a unique opportunity for students to have direct exposure to other cultures and backgrounds. Students should look for a college administration that is not only promoting diversity institutionally, but also fostering a climate where students can exchange differing ideas and perspectives in positive and meaningful ways.